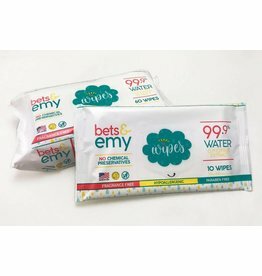 Bets & Emy makes soft and strong wipes for babies with no chemical preservatives, and was founded in April of 2016 by Emily Frazer, CPSM. Emily began work developing Bets & Emy wipes in 2013 after the birth of her son, Archie. Archie was born with a full head of red hair and very sensitive skin, and he was frequently troubled with diaper rash. 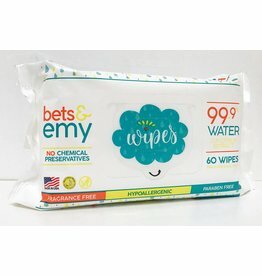 When Emily realized how many chemicals were in her baby wipes—even the “natural, fragrance free” baby wipes she was using—she believed the baby wipes were part of the problem, and began her search for something better. In August of 2016, after many months of sampling and testing, Emily’s first sample run of 1,000 packs was a success. She is proud and excited to bring you this alternative to conventional baby wipes.